On Friday, June 12th, the New York State Society of Professional Engineers (NYSSPE) awarded H2M architects + engineers a Project of the Year award for its Clarkstown Solar Field Over Landfill project. 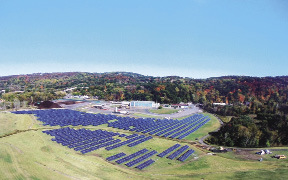 The Clarkstown Solar Field Over Landfill project features a 2.3 megawatt photovoltaic system, which consists of 4,300 solar panels on the 13-acre site. It generates enough power to supply about 200 homes, and will cover one-third of the electric needs of the town. The NYSSPE Project of the Year award recognizes outstanding engineering achievements that have captured the innovative and dynamic spirit of a profession dedicated to public service. H2M received the award at the NYSSPE's annual Installation and Awards Banquet at the Fort William Henry Hotel & Conference Center in Lake George. H2M is a full-service consulting and design firm.